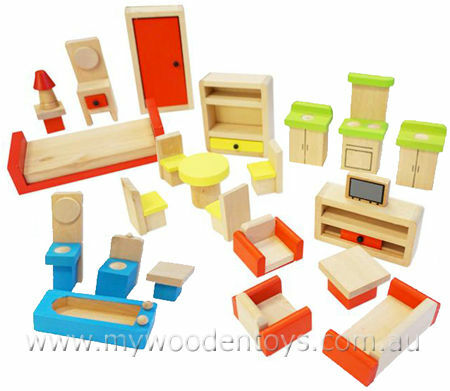 Wooden Dolls House Furniture Set is a lovely set of wooden toy furniture. This set comprises of 5 rooms of furniture, Kitchen, Bedroom, Bathroom, Dining, and Living room, complete with sliding cupboard and TV. Brightly coloured, this is a great addition to any Dollhouse. With 24 pieces it quickly makes a child's make believe house a home. Size: To give you an idea of scale - The wardrobe stands 12 cm high the bed is 14 cm long. Material: Wood, Child -safe paint. We like this because: "At last we have found a really lovely and solid wooden furniture set that won't break the bank." My order was delivered in good order and exactly as predicted. The process was professional and could not have been better. The items were exactly as described and the whole process was made easy and restored my faith in online ordering.